Our Apple Cider Vinegar comes from a farm in Ontario. It is made from ecologically grown apples, helping to improve our health and our environment. Apple cider vinegar contains over thirty important nutrients, twelve minerals, more than a half dozen essential vitamins and acids as well as a large number of enzymes. Its pH level is very similar to that of healthy skin so it can be used safely for many skin issues. It is therefore the most important ingredient in our hair rinse! 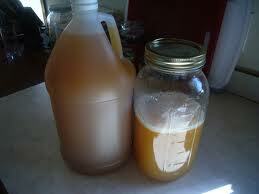 Our unrefined apple cider vinegar contains 'mother' and is the most nutritious Thus the cloudy colour.